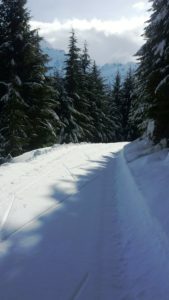 Winter of 2018/2019 Hopes and Expectations: We hope to see Razor Hone Road (the trails starting at the Salmon Ridge Snopark parking lot) groomed twice a week this winter. 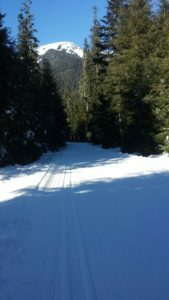 White Salmon and Hannegan Pass Roads will only be groomed on an occasional basis. 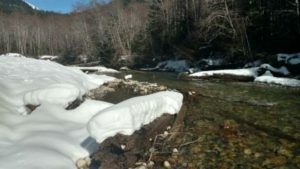 Anderson Creek Road washed out **again** at milepost 0.9, but thanks to Doug Huddle and Citizens for Forest Service Roads, we may have a temporary patch in place that might allow grooming once we reach a reasonable amount of snow. We’ll keep you posted. Latest news by email? I’ve been getting word from our groomer as he goes out to Salmon Ridge. Do you want to be the first to hear about it? I’m sending out a group email (addresses hidden) whenever I have grooming news that seems worth sharing. Get the details on this page. Note: if you do get out there while the groomer is there, please don’t box in his truck/trailer while parking. He needs a lot of space to load up and get out! 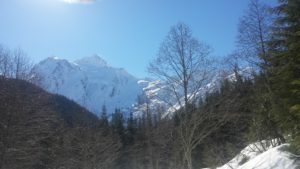 2019-02-17: It was a wonderful skiing day on Razor Hone. The grooming from Thursday has held up well with classic ski track. Both ends of Cougar Loop groomed (no track); the middle section is somewhat rough with fallen trees, deep snow that got rained on, etc. Passable, though. 2019-02-06. Bottom of the mountain: 2-3 inches of snow at Razor Hone – clearly not enough to groom. Some people have been skiing, but take old skis and expect to hit a few rocks. But it could be a bit of a base IF we get more snow on Friday. 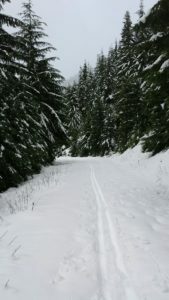 Mid mountain: Lots of snow at White Salmon, but no grooming. User created tracks in several inches of snow on top of a couple of feet of base. Even if you don’t have back country skis and don’t want to go up or down steep hills, on a day like today, drive up to the parking lot, put on your skis and go out for a few hundred feet and look around! You haven’t been hearing from me because I don’t have any news to report. The last that I was up the Mt. Baker highway was January 7. I’ve been watching the weather since then and it has looked like rain at the lower (Salmon Ridge) snopark. (The best source that I know of for weather is: https://forecast.weather.gov/MapClick.php?lat=48.903771761478716&lon=-121.69538497924805&site=sew&unit=0&lg=en&FcstType=text#.XEURqlVKjIV . It’s not right at the parking lot, but it seems to correlate pretty well.) Note that snow is predicted for Tuesday. I’m hoping to go up there later this week (not until Thursday) and will let you know what I find. White Salmon: Please consider parking diagonally rather than parallel. If there is enough room for it, we can fit more cars in. White Salmon: We’re trying to keep a set of classical tracks down the left side (outbound). They looked pretty good this afternoon (12/27)! 2018-12-8: It’s not that this page is dead, it’s just that there hasn’t been anything to report. 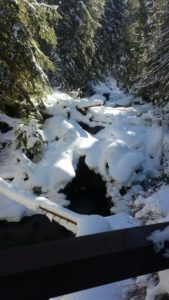 We were up at the far end of the Cougar Loop, working on the Salamander Adventure Connector Trail on 12/3/18 and while there was frost on the ground when we started, it was back to wet moss by the end of the day. We didn’t drive up to White Salmon, but by the looks of things, there wasn’t much snow up there. Vague reports from people who went up to the Mt. Baker downhill area and went out past the downhill slopes reported snow and fun times. But at this point, there are definitively no groomed trails. 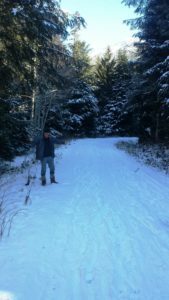 2018-4-11: Surprisingly enough, conditions for skate-skiing on Anderson were excellent! (1.5 km to wash-out) Smooth and fast! A little soft, but not badly so. I skied between 9 and 10 in the morning. I’d go early – I’d guess that it softens up quite a bit in the afternoon. 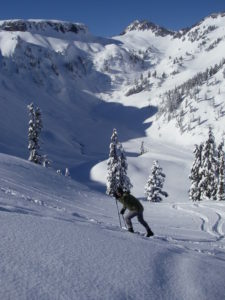 But if you were preparing for the Ski-to-Sea, it is a nice place to ski. I didn’t look at Razor Hone, but I’d guess that it is similar, but a little rougher. Conditions may change pretty quickly though. 2018-3-9: Still ‘fabulous’, but a little different. There’s been 2-3 inches of snow on the grooming that was done on 3/5. Skiers have skied in the classical tracks left from the grooming and they are in great shape. Skating is possible on the rest of the trail, but you’ll need to be a strong skater to appreciate it. The fresh snow is going to slow you down. The predictions are calling for sun for tomorrow, Sunday, and Monday. I’m guessing that it will be crustier and faster in the morning, softer and more forgiving (and slower) in the afternoon. 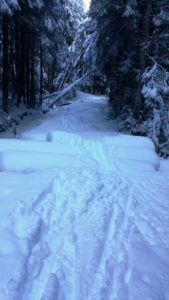 The Cougar Loop would make a great outing – but remember, the section between the two ‘high-points’, including the bridge is not groomed. If you are on skinny skis, you’ll have to ‘adjust’. I’d do it clockwise. 2018-2-20: Great classic skiing! Kick and glide! It would have been perfect to have skinny waxable track skis with extra-blue wax on them – not what I had, but it would have been great! Lots of nice snow, beautiful user-created tracks (see picture). 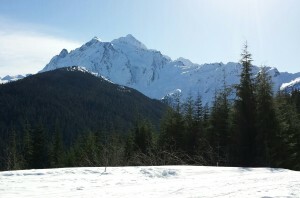 I skied up to the top of the Cougar Loop and it was very forgiving on the way back down. Conditions should be good for doing the whole loop (if you do, I recommend clockwise.) Temperature was 27 degrees at 12 noon. The groomer is planning to be out there this Friday and there should be enough snow for some beautiful groomed classic tracks. 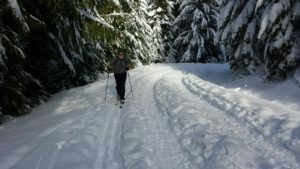 2018-2-12: Skate skis on White Salmon! White Salmon was groomed a number of days ago. No classical tracks were set, but there presumably was corduroy out past the turnoff to the SE extension and on towards the Knob. Since then, it has seen many a snowshoer and the corduroy is long gone, but it’s still relatively smooth and flat. Experienced skate-skiers should not have any trouble with it. (Probably not too good for beginners.) I continued on down the SE extension and the crust was as good as the grooming! The only problem is that from the viewpoint for this picture, it’s all uphill back to the car! I skied it about 11 AM. The highway was in excellent condition and the parking area had enough gravel/sand in it that anyone would be able to pull in and park. Of course, conditions could change in minutes! Do not drive beyond what you feel comfortable with. 2017-11-06: All the highway traffic delays (steel bridge and new bridge construction) have been removed. WSDOT workers may be finishing the road edge bamboo pole placement along the upper highway segment that I saw them working on today. 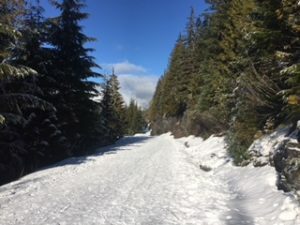 There was insufficient snow and the roadways were churned up by vehicle tracks on Hannegan, Anderson Creek, and Razor Hone roads (a surprise to see Razor Hone and Anderson Creek Road gates still open after November 1st). White Salmon Road (just below the lower Ski Lodge;, ski resort facilities still not open) had the typical narrow plowed parking area. Snow appeared sufficient for ski and snowshoe but I didn’t spend much time there. 2017-4-4: At Razor-hone, plenty of snow with good conditions. [remember, the last grooming was March 17.] There are two water breaks between mile 1 and Blueberry. Anderson Creeks side is about finished. Up to mile 1, fair conditions. Miles 3 to 5+ good conditions with an inch of new on a hard base. 2017-3-30: While last groomed two weeks ago, it was beautiful skiing today at Razor Hone. 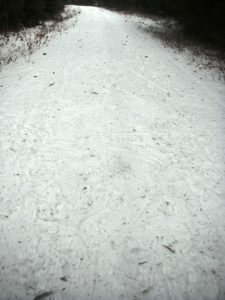 I skied (skated) to the top of the first hill on 1-2 inches of fresh snow on top of smooth, level, packed snow. It was slow, but very nice. Excellent workout for Ski-to-Sea-ers! I skied out to the first corner on Anderson and it was even nicer. Not much in the way of classical tracks, but it would have been great striding, even so. I stopped at White Salmon – 6-8 inches of fresh snow on a six foot base. Then I went up to Heather Meadows to try out my new Hok skis. While I’m not the first to extol their virtues (thanks, Dale), I’m the most recent convert. Short and wide, they are a very forgiving pair of skis. They are similar to snowshoes while tromping around on the snow, but they allow sliding back down on the way home. I’ve skied (non-expertly) back-country for decades – these are a game-changer! Talk to me if you want to try them out! The highway was in great shape, with a little bit of slush above White Salmon on the way to Heather Meadows. 2017-3-15: The Salmon Ridge Sno-Park parking lot was plowed down to gravel by DOT today. No longer will your AWD Subie become mired up to the roof in some deep, wet hole in the middle of the lot. 2017-2-24: Time to go ski! RazorHone: groomed, with tracks. Excellent skating. I skied it at about 11:00. It was fast, but with sufficient texture for control on the hills. (I didn’t go up Cougar). I’d guess that morning is best for fast skiing, skating in particular, and afternoon would be best if you want softer snow. Roads: the road out to RazorHone was bare pavement, with a few wet spots. The road up to White Salmon had some slushy snow and ice, but with sanding by the highway department. Please use your own judgment – but it’s in pretty good shape. The Salmon Ridge parking lot was plowed out this morning and can be navigated with any car. Dogs: My understanding is that the Forest Service says that dogs should not be taken on groomed trails. I know that some people would like to change this – BUT, if you take your dogs on the trails, be a good citizen! Between yesterday morning and today, someone’s dog left a pile of ‘special brown’ in the middle of the freshly groomed trail out near Cougar. This is not the way to win friends and influence people! Hannegan Pass Road: not groomed. 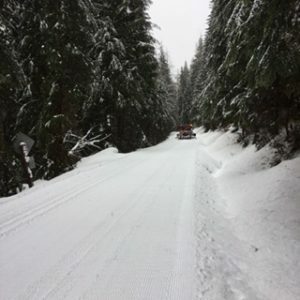 2017-2-3: Grooming happened this morning, although no report on whether White Salmon was done (I’m guessing, probably not…) Kveta reports that Anderson has ‘great conditions’. 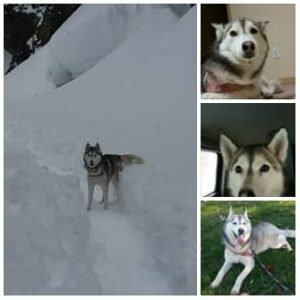 2016-12-30: All is well – the dog has been found and is happily back with its owner. 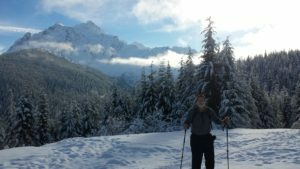 2016-11-29: November and skiing! Just got back from a nice ski at White Salmon. I went down to the far end of the new SE extension. Lots of (relatively warm, wet) snow and user-set tracks, but no grooming yet. No snow at all at Razor Hone / Anderson. Weather: overcast, 34 degrees at White Salmon, 37 degrees at Razor Hone at 2 PM. View from the Knob. Note corduroy in foreground. 2016-02-22: I was out of town, but am back and just did a trip up to Salmon Ridge. I was up from 2:00 – 4:00 this afternoon; temperatures in the high 30’s, sunshine with a few clouds, highway in great shape. White Salmon: plenty of snow, 8-12 inches + on top of old grooming. Nice ski tracks on top of old snowshoe tracks allowing a little kick and glide, but no skating. Touring skis would give you a great ski out. I’m hoping the groomer will be out later this week – if so, this should be some great skate and track skiing. I didn’t go all the way out, but it looked nice. Razor Hone: Better than expected! (I expected nothing but road…) It’s still relatively flat and smooth. Possible to skate, or kick and glide in nice tracks left by other skiers. But when you get to the first hill, the snow is pretty thin. Everything is ‘covered’ – but only enough so that it is hard to see the icy/rocky spots. I’d still ski it, but use care coming back down any of the hills. I only got out to the top of the first hill. Anderson: I didn’t ski out it, but the first part looked like Razor Hone. Possible to skate or kick and glide. I’m assuming the rocky parts that I saw the last time that I was out there are only just barely covered with snow. If I find out about grooming, I’ll post a report. 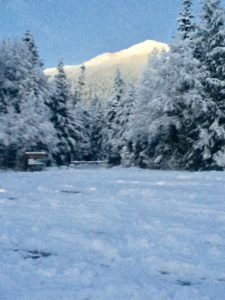 White Salmon: 8-10 inches of new snow, sort of ‘light snowball’ quality. (30 degrees @ 3:00 pm) Unfortunately, someone was able to drive their truck around the big berm that DOT piled up and drove out over the first rise. I’m guessing they didn’t go past the hairpin and down the big hill, but I didn’t go out there. It would probably be a nice tour out to the knob, if you kept your thoughts light as you skied around the truck tracks. A few skiers and walkers had at least started up the trail. If anyone goes back to the knob, please send in a report. Razor Hone: One ‘short’ inch of ‘crusty’ snow on top of the old hard-pack. (33 degrees @ 3:00 pm) Not too bad skating on the first flats, OK tour skiing, but the tracks aren’t in good shape. I’m sure the hills have lots of rocks in them, but I didn’t go back there, either. 2015-1-10: Walked around the Jerry Bourne trail with the dog. A great trail around the pond, no snow shoes needed. The dog loved it! 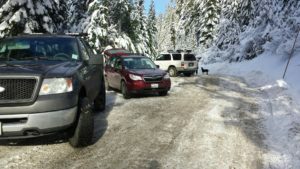 Two cars stopped at Hannegan Pass road, but upon seeing people were driving down it, they left. Too bad there’s not enough snow to berm up and keep the vehicles out so people could ski here with their dogs. Arrived at Razor Hone road 1pm, 39 F, gray and misting. We skied down Razor Hone, the flat part was great. But going up the first hill, there were lots of rocks in the middle of the road. I tossed several off the road, but there are still lots left. 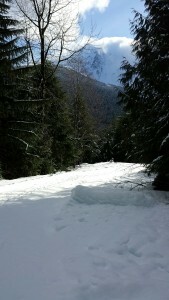 The snow got very thin before getting to the Cougar trail as you near the top of the RZ hill. So we turned around. From here, some folks took off their skis and walked down the hill. That is probably the wisest course of action unless you are very skilled at dodging rocks. 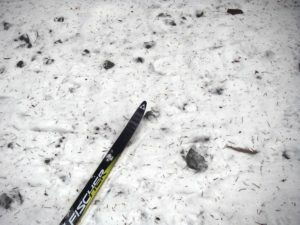 I skied, missed most of the rocks, but did manage to hit one and have a new scratch in my good skis. My husband, who’s a good skier, was less fortunate. He tried to ski down, but caught a ski on a rock and was thrown hard onto his shoulder and head. We ended up going to Urgent Care. My advice: if you are desperate to get out to ski, stay on the first flat part of Razor Hone. If you really want to venture further up the hills, take your ‘rock’ skis. Beware of lots of rock and thin areas. 2015-1-9: Razor Hone, Anderson, and White Salmon are all groomed! And they are skiable! Thanks to our groomer for doing an excellent job with marginal materials. 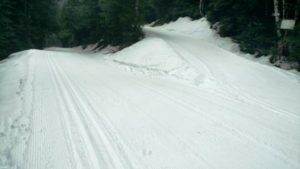 White Salmon – groomed with ‘corduroy’ but no tracks. Snow depth 4″ and melting. First part probably good for this weekend, but no more. Gravel showing in a number of places. If you skate, probably best to use ‘rock’ skis. Anderson – groomed with corduroy but no tracks for 0.9 miles. Currently beautiful! Should last through the weekend and more. Good for inexperienced skate skiers. Razor Hone – groomed with corduroy AND one set of tracks. Excellent condition to the end of the flats, noticeable gravel showing in spots on the hills. Tracks in pretty good shape all the way out. Cougar Loop not groomed (and with many bare sections.) Should last through the weekend and a little more, although the gravel is only going to get worse. Temperature: 41 degrees @ White Salmon, 34 degrees @ Razor Hone, early afternoon. Anderson – This was a real surprise. It actually was awesome! Very smooth skiing with gentle up and down hills. If you want to try skate skiing, this is the place to do it. (no tracks) Touring skis would be fine, too. My guess is that it will be sort-of crusty and fast in the morning, a bit more forgiving (and slower) in the afternoon. If you are a beginner on skate skis, when you come to the orange/white ‘saw-horse’ sign, stop and consider the hill. The tree you see across the trail at the bottom of the hill is the washout. Razor Hone – The first flat area is almost as nice as Anderson, plus it has a good set of tracks down the side. Then as you start up the first hill, you’ll see some gravel, but you can ski around it (the track is clean). The second hill is a bit worse, but still skiable. But be careful when you come back down. 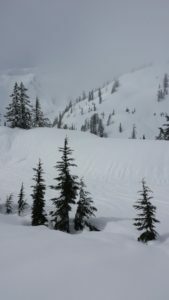 I hiked up the far side of Cougar, thinking I was going to ski down the near side, but ended up walking down half of it because of bare spots. But it made a fun loop. (I didn’t go past Cougar) Like Anderson, I’m guessing fast in the morning and late afternoon, slower and more forgiving in early afternoon. Summary: Beats sitting on the couch! White Salmon – Jan 9.